I loved that the familiar fairy tales were a little grosser, a little raunchier, and a lot funnier than their Disney counterparts (and the accompanying illustrations by Quentin Blake didn’t hurt, either). Maleficent (the one from Disney’s animated Sleeping Beauty, that is) is, hands-down, my favorite Disney villain. She’s dark and scary and and powerful . . . and she can turn into a ridiculously frightening, fire-breathing dragon. But I haven’t brought myself to see the new movie yet. I’m a little wary of a story that casts Maleficent in a kinder, more sympathetic light. Her name is Maleficent, for goodness’ sake. She shouldn’t have a tear-jerking backstory. She’s just evil. See, in my mind, if you’re retelling a fairy tale, there are certain things you don’t mess with. Among them are: 1) you have your good guys and you have your bad guys (and there is not a fuzzy line between the two), and 2) in the end, the good guys live happily ever after. Despite taking some liberties with the fairy tales, Roald Dahl had it right. In Roald Dahl’s “Cinderella,” even though Cindy forsakes the prince, she still ends up happily ever after (married to a simple jam maker). “Their house was filled with smiles and laughter” – that is what we, lovers of Frozen, have come to expect from our fairy tales. Plus, it’s tradition; the original (darker, gorier, more gruesome) tales from the Brothers Grimm followed those guidelines. 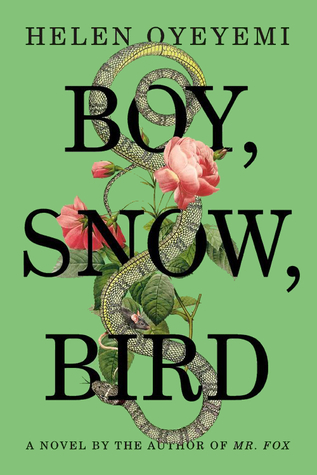 So, when I read that Boy, Snow, Bird is a retelling of Snow White, I had some preconceived notions of how it should play out. And it did not meet my expectations. This is a problem, I strongly believe, not in the book itself, but in the marketing of this book. A word of advice: do not, I repeat, DO NOT read any of this book’s blurbs. Ignore the ones on Amazon and Goodreads. And don’t even think about skimming the dust jacket blurb. First of all, they give away much, much, much too much about the important and interesting plot points. I knew too much going in, and, in retrospect, I wish I could have been surprised by certain “reveals” throughout the book. (Because of that, I am purposely making this review extremely vague where plot and character are concerned.) Secondly, the blurbs will lead you astray. They will make you pine for a sweet little fairy-tale story that has well-defined good guys and well-defined bad guys and ends “happily ever after.” And, if you go into this book with those expectations, you are bound to be disappointed. I struggled with the rating of this book. If I had looked at it strictly as a “retelling of Snow White,” I would have given it a much lower rating. But I keep reminding myself that’s not really what it is, and I shouldn’t devalue it based on poor marketing strategies. One of the bigger houses had brambles growing up the front of it in snakelike vines. The smell of baking chocolate-chip cookies aside, it looked like a house you could start fanciful rumors about: “Well, a princess has been asleep there for hundreds of years . . .” and so on. The front door was open, and the porch light was on, and a little girl came around the side of the house, singing loudly. I couldn’t see her face properly—it was obscured by clouds of dark hair with big red flowers plaited into them—but she had a large cookie in each hand and more in the pockets of her dress [. . . ]. I didn’t stop at the gate to greet her even though I heard her saying “Hi” in a startled way. I just said “Hi, Snow” as if we’d met before, when of course we hadn’t, and I kept going, kept my gaze fixed on the road ahead of me. But Boy, Snow, Bird is not itself fairy tale. It is a book set in mid-century America about some hefty themes: perception, racism, beauty, identity, and fear. In addition to the evil stepmother and Snow, there is a large cast of supporting characters that aren’t plucked from the fairy tale. There is a horrid and abusive rat-catcher father, a racist and snooty grandmother, an eccentric old bookstore owner, an ahead-of-her-times, working-woman BFF. At times the characters add to and further the story . . . but other characters serve only to confuse and distract from it (not to mention that interchangeably referring to them by their first names at times and their last names at others only adds to that confusion!). This is the first book I’ve read by the young and highly acclaimed Oyeyemi, and I found it to be beautifully and quirkily written. The New York Times Sunday Book Review described Oyeyemi’s style aptly: “preoccupied with classical and contemporary parable mashed up with her own exquisitely tailored phantasmagoria, evoking Toni Morrison, Haruki Murakami, Angela Carter, Edgar Allan Poe, Gabriel García Márquez, Chris Abani and even Emily Dickinson.” There are gorgeous moments of magic realism (people who don’t appear in mirrors, conversations with spiders, picnic blankets that come to life) nestled together with allegories written by little girls in letters to each other juxtaposed with frank dialogue. The resulting stylistic mish-mash is surprising and engrossing and delightful. My one big beef is this book’s ending. I am still trying to separate myself from my fairy-tale expectations and look at the ending objectively. Putting aside those “happily ever after” expectations, it was still disappointing. It is rushed, out of left field, and serves simultaneously to distract from and compound, rather than resolve, the book’s other conflicts. But, aside from the ending, the book was extremely readable and engrossing. It is clever and creative. I would recommend it–not as a fairy tale with a happily-ever-after ending, but just as an interesting, stylistic, and thought-provoking book about race and identity. Who should read it: Eds (i.e., people who are drawn to both style and quirk and appreciate books with heavy—and not always happy—messages). This entry was posted in Rating: 3.5/5 and tagged Book review, Book Reviews, Books, Boy Snow Bird, Brothers Grimm, Fairy tales, Helen Oyeyemi, Roald Dahl's Revolting Rhymes. Bookmark the permalink. Great review! I’ve been wanting to read this one. I actually don’t mind stories that turn fairy tales on their heads and make the bad guys more sympathetic so I’m very curious what Oyeyemi does here. Glad you liked the review! I’m curious to hear what you think of the end of this novel. Let me know once you’ve read it! Just saw China Dolls in the bookstore and was curious about it. Will look forward to your review (before I read it!!). I thought of you when I picked it up. Just started reading it, and I think you would enjoy it. I will keep you posted . . .